His theme looks at transfer of military technologies into civilian applications and provides interesting insights into everyday items: from microwave ovens and the Swiss Army knife to Geostationary satellites! They should add infrared/thermal imaging of course. If you're looking for an infrared photography calendar for 2011, since I don't produce one, then you should check out Simon Marsden's Haunted Realm and Poetry of the Dark calendars. More information on his web site www.marsdenarchive.com. I should also mention that Simon will be giving a talk called The Twilight Hour, and promoting his latest book, at Waterstones in Canterbury next Thursday (November 3rd) at 1830. It costs £3 to see him but that is refunded if you buy the book. Great news that the Royal Society has decided to make its archive freely available on line on a permanent basis. This is covered on this web page which also gives a link to the archive search page. Herschel was prolific. There are 33 papers of his published in 1800 alone. He was the very model of a major scientific mind. Phil Trans was freely available during 2010 as this was the Royal Society's anniversary year, and access to the papers was very helpful to me when I worked on my history of infrared photography. Many people believe that open access to scientific papers, many of which are reporting publicly funded research, is definitely something to encourage. The Royal Society says their decision is part of its 'ongoing commitment to open access in scientific publishing' and I salute that. Another opportunity to see some of Elliott Landy's great photos of 60s musicians, including some stunning colour infrareds and including his Dylan shot. 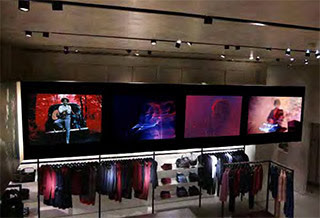 It's not in a gallery; it's at the Armani shop in Saint Germain des Prés (149 Boulevard Saint-Germain) in Paris. It opens tonight (18th) and runs for a week. Magnum and Armani have created a collection of my '60's Music photos which features some of my abstract and especially colorful imagery - a different group than I normally exhibit - less literal and more painterly. They are printed on a variety of non-paper media in large sizes and have never been printed this way before. Some of the images have never been exhibited prior to this show.